4. The figure represents the process of expression of gene X in a eukaryotic cell. (a) The primary transcript in the figure is 15 kilobases (kb) long, but the mature mRNA is 7 kb in length. Describe the modification that most likely resulted in the 8 kb difference in the length of the mature mRNA molecule. Identify in your response the location in the cell where the change occurs. (b) Predict the length of the mature gene X mRNA if the full-length gene is introduced and expressed in prokaryotic cells. Justify your prediction. 1. The difference between prokaryotic cells and eukaryotic cells. Cellular life forms are divided into three domains, Archaea, Bacteria, and Eukaryota. Microbes belonging to Archaea and Bacteria are small single celled organisms called prokaryotes. The defining feature of prokaryotes is that they lack a nucleus. Instead the genetic material of these organisms is a circular double stranded DNA chromosome located in a region of the cytoplasm referred to as the nucleoid. Prokaryotes also lack mitochondria and membrane-bound organelles thus the prokaryotic cell is open cytosol with ribosomes floating freely. In contrast, eukaryotic cells have a “true” nucleus housing chromatin (DNA wrapped around histone proteins) that will condense into linear chromosomes when the cell divides. Prokaryotic cells and eukaryotic cells also differ in the way genes are expressed. Prokaryotic cells have compact genomes that lack introns or large non-coding regions. The genes of these organisms are expressed in groups, called operons, that are transcribed on the same piece of RNA and then made into separate proteins. Since prokaryotes lack a nucleus, DNA transcription into RNA and RNA translation into proteins can occur simultaneously. The DNA of eukaryotic cells however, is enclosed in the nucleus so transcription must be completed and the mRNA sent out of the nucleus before translation can occur. In eukaryotic cells, mRNA transcripts are modified before they are translated because they contain introns that need to be removed. Thus the mature mRNA that leaves the nucleus will only contain exon sequences that will be translated to protein by ribosomes in the cytoplasm. With that background knowledge, we can look at part (a), which says that a 15 kb transcript is produced but the resulting mature mRNA is only 7 kb. The question asks that you describe the process that contributes to this size difference and identify where in the cell the change occurs. The process as we described is RNA processing, that occurs in the nucleus, which removes introns and splices exons together to form a mature mRNA transcript that can be sent to the cytosol for translation. Yes, that’s really all they were looking for but you had to recall that background knowledge to answer the question. Part (b) asks what the length of the mature mRNA would be if the gene was expressed in prokaryotic cells. 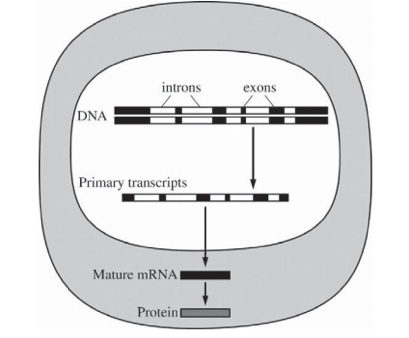 Remember that prokaryotic cells do not contain introns normally so mRNA processing machinery doesn’t exist in these cells, thus the length of the mature mRNA would be 15kb, the same length as the primary transcript. It’s essential that you have a clear understanding between prokaryotic and eukaryotic cells, as this is a fundamental concept in biology. Also, know that DNA is transcribed into RNA, which is translated into proteins and review the details of these steps because it’s bound to pop up again! Are you interested in getting a biology tutor to help you prepare for the APs? Here are some additional blog posts on the subject of biology!